Members of the Jersey Devils Bicycle Club cross Broad Street on Spruce Street in Center City. 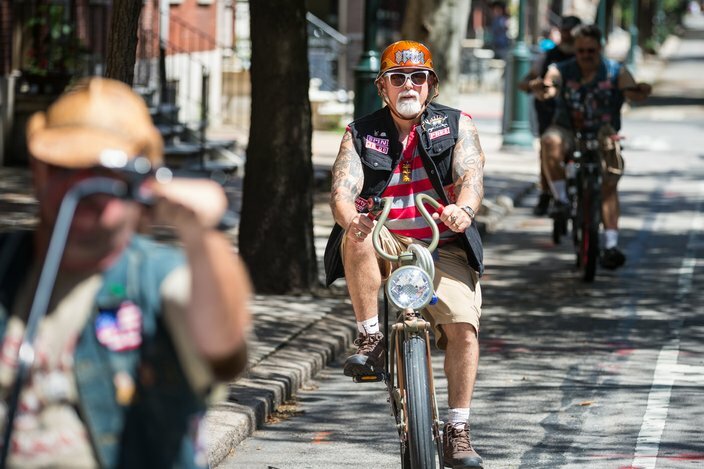 The Jersey Devils came to Philadelphia last Thursday on one of their monthly "WTF" rides, their banana-seated bikes with ape hanger handlebars and classic Schwinn bikes and customized cycles cobbled together with spare parts and imagination. The members of the six-year-old South Jersey bike club, who take their inspiration from the Kustom Kulture of California hotrods, aren't riding to keep fit and don't care much that they don't fit the cycling stereotype. They are middle-aged – and older. “This is the AARP crowd,” shouts one. Not made for Lycra, but definitely for denim. And there is literally, and figuratively, no room for skinny jeans among the Devils. Tats, while not mandatory, are commonplace. Members of the Jersey Devil Bicycle Club stop at 6th and Market streets near the Liberty Bell in Old City, during last Thursday's ride. 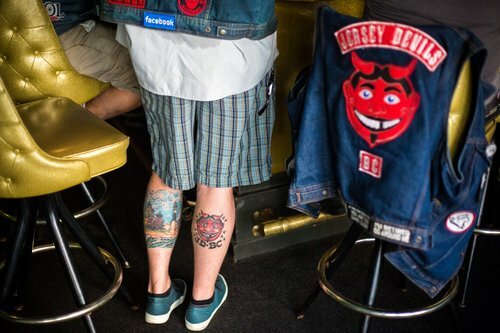 Oh, and club colors: a smiling devil's head inspired by Tillie, the iconic face of Asbury Park, a favorite place for what they call "cruisin'." 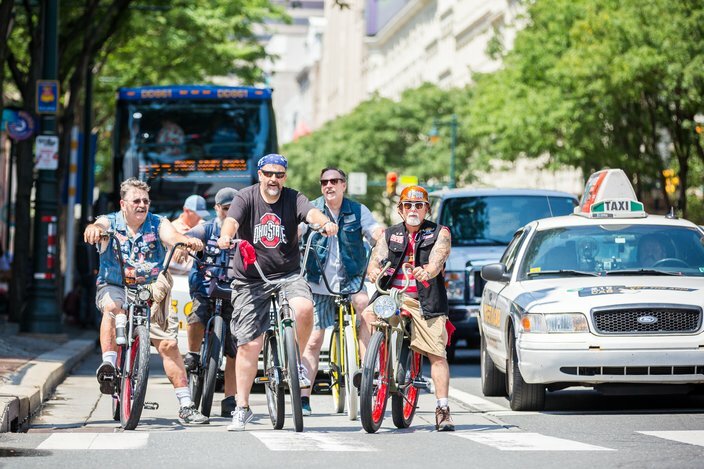 The Devils, whose slogan is “start slow, then ease up,” began their ride around a steamy Philadelphia with a pit stop before getting down to heavy-duty biking. The first stop after hopping off PATCO: Tattooed Mom on South Street for lunch. And beer. “It’s a wonderful day. I got a Narragansett in my hand. I got balls to bust. It can’t be any better,” said Chris "Big C" Cominetto. There was a greater purpose to this particular "WTF" ride, however. The Devils were making a not-so-dry run ahead of the Sept. 24 Philly Free Streets event. Eight-plus miles of city streets will be closed to traffic for use by walkers, joggers, skateboarders and bicyclists. South Street will be closed to cars from Front Street to the South Street Bridge. And while there are likely to be thousands on South Street for the freeride, the Jersey Devils Bicycle Club will stand out. Like a pack of 12-year-olds stepping out of Mr. Peabody’s WABAC machine, they will be on distinctive old-school bikes. It will be the first open streets ride for the riders. Jersey Devils co-founder Michael Spinelli, also known as 'Spin,' rides along Spruce Street last Thursday. Except for Cominetto, who just happened to be in Munich when most of the city’s center was closed for a huge annual bike night. In Germany, but without a bike, he rented a ride and had a blast. “It was incredible! There’s nothing like it,” said Cominetto. Harry Deaner, who goes by 'Chips,' makes a quick repair to a fellow member's bike in front of Via Bicycle on South 9th Street in South Philadelphia. Over lunch, Philly resident Shawn McGinley – the youngest of the group at the age of 41 – was accepted to try out as a club prospect. McGinley, who favors a cowboy hat and was described as a “resourceful little guy, like Rocky the squirrel,” says he’s looking forward to riding South Street sans traffic. 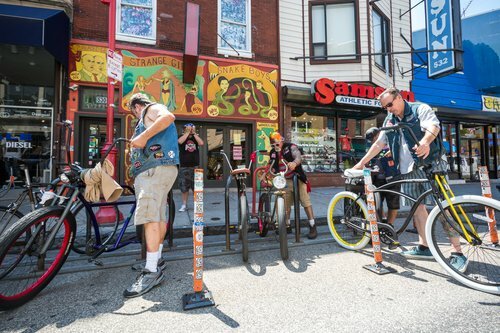 Members of the Jersey Devil Bicycle Club lock up their bicycles in front of Tattooed Mom on South Street. 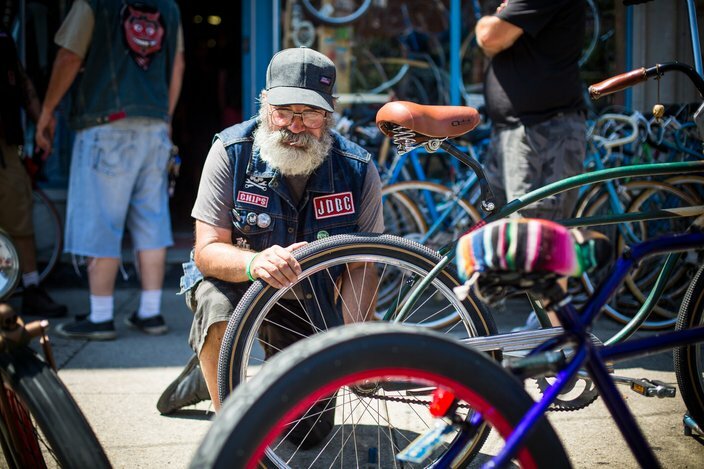 He thinks the 8 a.m. to 1 p.m. event will be fun, though fellow club member Harry Deaner III worries about having that many people on bikes on one street. “We’ll be dominating the ride on these bikes,” he said, laughing at himself. Russ Gelpke, nickname 'Skelz,' stands at the bar during lunch. As well as South Street, the ride will extend to the Schuylkill River Trail and on to Martin Luther King Drive, ending at the Belmont Plateau in Fairmount Park. In total, the path runs 8.1 miles. 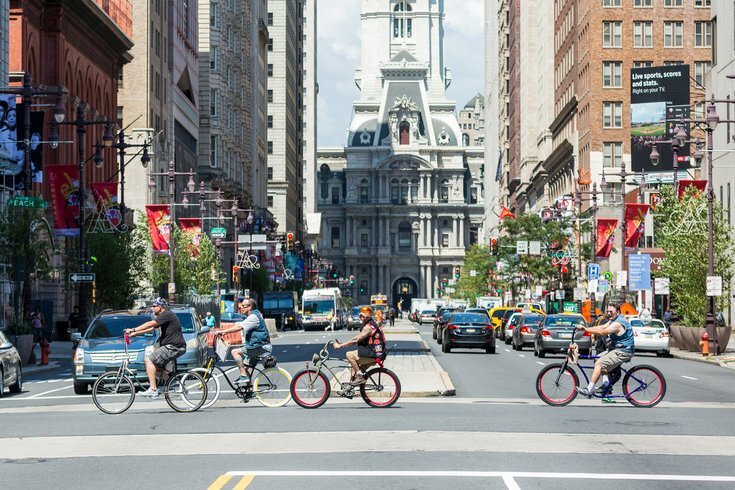 Open Streets PHL, which is helping the city with the South Street freeride initiative, is holding a fundraiser on Aug. 25 at the Pop-Up Garden at the Reading Viaduct Rail Park, at 500 N. 10th Street. Admission is $25. The organization will use the proceeds to push for more open street rides.